The burdens of life press in on me. The responsibilities of parenting and marriage, work and finances can keep me running from one task to another, leaving me exhausted and distracted. A short time ago, my children rescued me from the dreary landscape of obligation, and reawakened a sense of wonder and gratitude within me. Dressed for work, I poked my head into the bedroom where my sons were playing. Although I like to spend a little time with them before going to work, I already felt that familiar internal tug: “I really need to get going. I have so much to get done today.” But my boys, still in their PJs, would not be denied — they needed to wrestle with dad. This day’s particular variation on “wrestle with Dad” turned into “peanut butter sandwich;” the boys would take laughter-filled turns “being the peanut butter or the top bread,” with me always being the “bottom bread,” where I could be appropriately smooshed flat by them climbing on top of me. Amidst this joyful tangle, I paused and just took in the delight and brightness in my children’s faces. I gazed at them (still laughing and playing), and a transcendent sense of contentment and satisfaction filled me. In that moment, I wanted for nothing. Through their natural magnetism to playful connection, my children rescued me from bleakness, and reawakened me to joy. What parts of your life have become barren? Perhaps a multitude of obligations pester you, leaving little room for peace. Maybe you carry a burden of regret, continually lamenting past events and choices. Or possibly you approach the future with a foreboding sense that things will fall apart, given enough time. Whatever the source of your discontent, in this moment, you can sense that you want to live with a greater sense of peace. 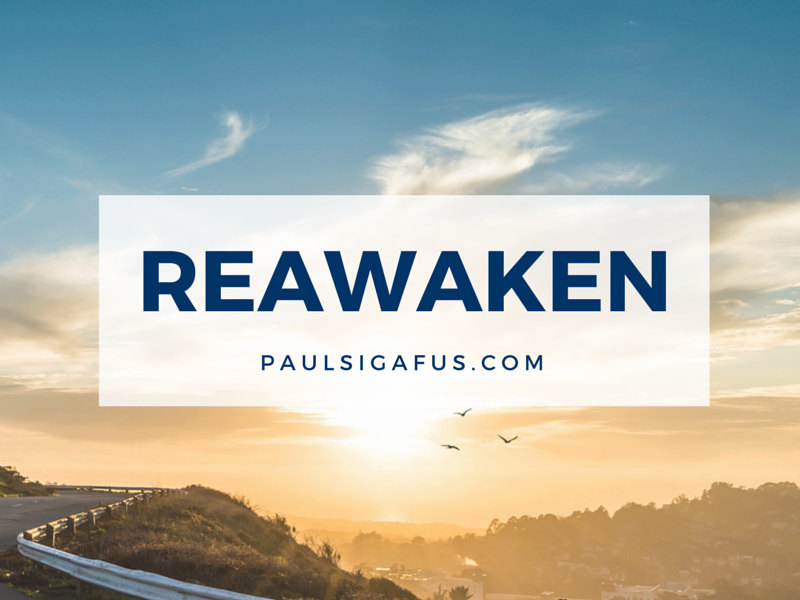 You want to reawaken to contentment. Your heart longs to open itself to love. I feel that tension too—the strain between my burdens and my heart’s true desires. And I won’t pretend that I’ve found a way to banish the burdens once-and-for-all. Yet, my experience wrestling with my boys tells me that more joy, more peace, and more love is available to me and to you than we probably realize. In that moment with my children, I made a tiny decision to “open the door” to my heart’s true desire—to enjoy playing with my kids. That small choice made a big difference in my day. This didn’t mean that I neglected my other responsibilities; it just meant that I took a little time for joy. I have the sense that opportunities like that will appear more often as we look for them. In the next few hours, you’ll probably have an opportunity to say yes to joy. When a moment of joy comes knocking, why not open the door and let it in? Set aside your worries, resentments, or burdens, at least for a moment. Aren’t you tired of being pushed around by the heavy things in life? How about making a little more room for enjoyment? Laying down your burdens for five minutes (or two, or twenty) won’t make you any less effective in carrying them later—in fact, taking a break will probably give you more energy and more courage to face your challenges. My children’s laughter and happy faces reawakened me. If you want to wake-up to life and to love, there are few things better than gazing at a loved-one’s face, or looking with love into their eyes. Truly behold them, in all their individuality, complexity, and wonder. Behold them with compassion, gratitude, and curiosity. There are many ways to do this, even if you live alone. You could picture your grandmother’s loving face. You could gently behold your children as they sleep. You could take your loved one in your arms, then pull back just enough to behold him or her with delight. You could remember the warmth in a dear friend’s eyes. You could imagine the benevolent face of God. Pause. Breathe. Take it in. If you find even a small sense of joy or peace in doing these things, pause. Breathe. Take it in. In our rushing about, we often impoverish ourselves—not because there is no goodness in our lives, but because we don’t slow down enough to really savor it. So, then next time your spouse says something witty, the next time you feel touched by someone’s courage, or the next time you feel blessed by the deliciousness of life or love (or ice cream), take it in! Linger there a while, fully absorbing the loveliness of the moment. One way to expand your sense joy and aliveness is to share it with someone. Thank someone for a shared moment of joy, even if the moment happened days (or even years) ago. Remembrance of joy can breathe life into the present. After wrestling with my boys, I said, “That was fun! I love being with you.” There are few of our relationships that couldn’t benefit from more expressions of appreciation, either in the moment, or as a joy remembered. If you’re like me, these things take practice. It’s worth it, though! There are human-shaped invitations right in front of us, just waiting for us to reawaken to shared moments of life, love, and joy.